Amsterdam, The Netherlands – Hundreds of domestic workers from various nationalities rallied and marched yesterday, 2 November at the Museum district, one of Amsterdam’s main tourist attractions, to demand that the Dutch government recognize “domestic work as work” and ratify the ILO Convention C189 concerning decent work for domestic workers. The domestic workers from Latin American countries, Africa, the Middle East, Indonesia, and the Philippines, were joined by their advocates and supporters from the FNV (Dutch Federation of Unions), churches, Dutch political parties, and migrant rights advocates. Majority of the domestic workers who are undocumented, are demanding legalization because of the valuable work they do for many Dutch families, their overall contribution to the Dutch economy and society, and for legal and humanitarian reasons. Leaders of domestic workers’ groups say recognition and legalization would enable hundreds of thousands of domestic workers in the Netherlands to enjoy the same labor rights as those of Dutch workers. With their the central call to “Legalize Our Work”, the domestic workers also stated in their placards: “We are not criminals, we are workers”, “100.000 Dutch families rely on us”, “I want to pay taxes”, “I dream of a BSN (social security) number”, “The union recognizes me as a worker”, “Your children are growing up with us”. Domestic workers themselves and their advocates who joined the rally agree that the mobilization yesterday was a historic and a breakthrough. “From invicibility to visibility”, described one Dutch advocate about the mass action. 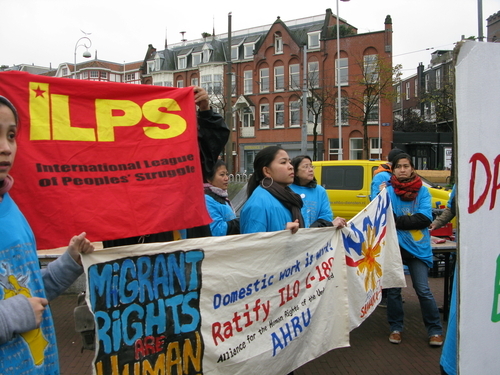 Among the organizations and groups represented were the FNV Bongenoten, Alliance for the Human Rights of the Undocumented (AHRU) – an alliance of migrant organizations in the Netherlands, Migrante Europe, Pinay sa Holland, Indonesian Migrant Workers Union, Latin American and African Domestic Workers, the World House, Migrant Domestic Workers, and the International League of Peoples’ Struggle.